Ok, so I guess it’s been a while since I’ve posted here, huh? Every time I’ve thought about it, I’ve been daunted by all the things that have happened that I’d need to catch you all up on. Tonight, I’m refusing to be daunted. Things happened, I failed to blog about them, so be it. There. Done. I’ll try to post again before another 18 months have elapsed. 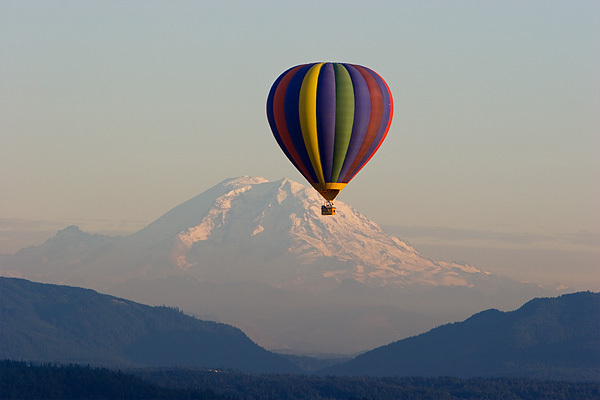 Last week, Becky and I got to go on a hot air balloon ride from Woodinville. It was amazing. We really lucked out with great weather that day; it had been raining a couple of days prior, and most of the days since have been at least cloudy and cool. Here are some of my favorite images from the flight. The yellow balloon was ours; the one with vertical stripes was the other half of the group we flew with. 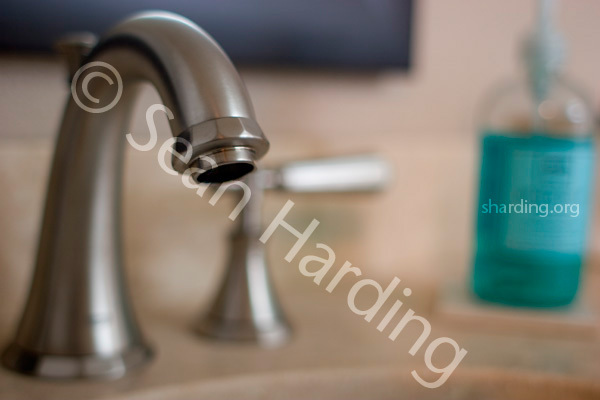 Many of you have heard at least something about the struggle we’ve had getting our master bathroom remodeled. I won’t recount the whole saga here, but suffice it to say it’s been stressful. It is now, at last, done. (Well, 99.9% done — there are a couple of small things to finish up). I wouldn’t say I’d do it all over again, but it is definitely a huge improvement. Continue reading to see the before and after photos. 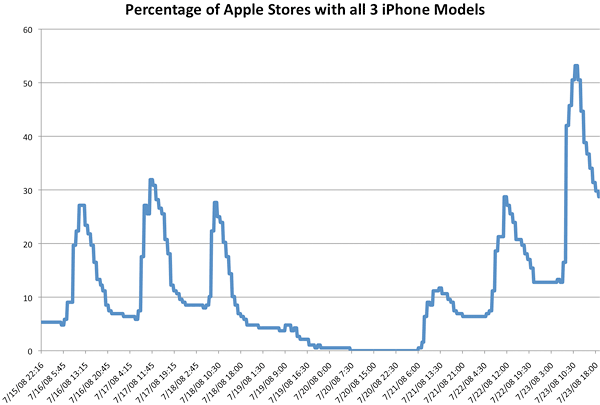 Things are looking better for finding iPhones, but they’re still not universally available, and there are still lines. Availability was very low over the weekend, but overall it’s been trending upward. Chris Barnes put together a tool that surfaces this data in real time. Good stuff. I actually have an interface that does the same thing, but I decided not to release it to the public (partially because I was too lazy to get it polished enough to not be embarrassed by it, and partially because I didn’t want Apple to get annoyed and shut off the data feed). I finally was able to get my hands on an iPhone 3G (black 16GB, at Bellevue Square). But I’ve continued to be kind of fascinated by the whole issue of availability. Finding an iPhone is still not easy in many parts of the country! 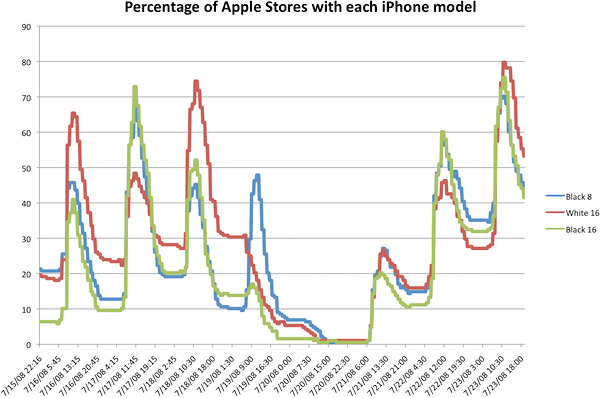 I’ve been gathering some data from Apple’s availabilty checker (which I disparaged in my last post). It isn’t 100% accurate, but it appears to be better than I originally thought. The trick is that it seems to be showing current availability, even though the page is worded to make it sound like it’s showing the next day’s availability. So after the Apple Store has closed for the day, the only way that page is going to show phones as available is if they had some left over at the end of the day. If they’re getting more the next morning (as many stores have been), it won’t be reflected on that page. Of course, the page also doesn’t tell us how many phones are in stock — if it’s only one, you’re not going to have much luck getting it. Anyway, I started collecting the data that the availability checker page shows a couple of days ago. If you can look beyond my embarrassingly bad Excel charting skills, these may be interesting (yes, I should be using Google Charts, but I wasn’t feeling patient enough to figure out how to make it do what I want, and gnuplot gives me a headache every time I use it). You’ll notice that stock goes down over the course of the day (i.e. 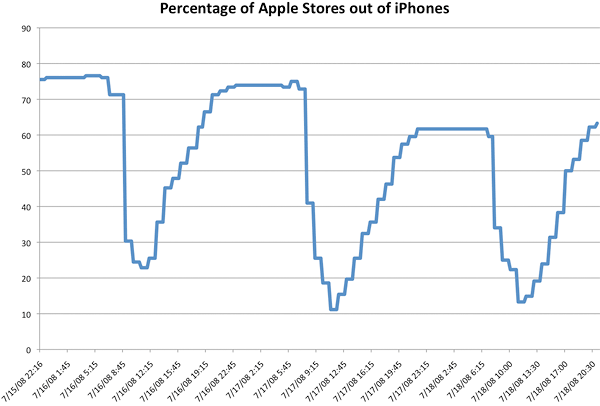 stores run out of stock), then it spikes back up again in the morning. Charts updated July 18 at 9:15PM PDT, the rest of this post reflects data as of the evening of July 17. 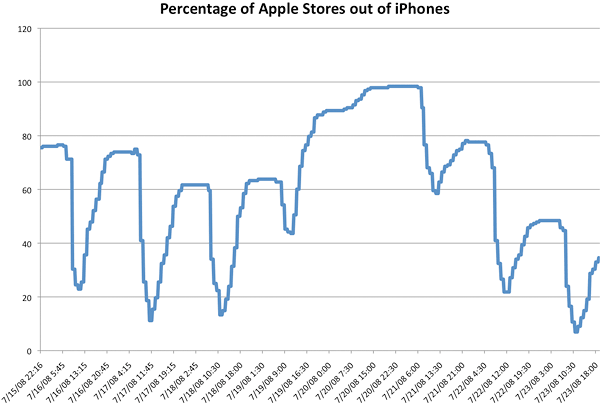 Since I started collecting data, only one store has never shown as having any iPhones in stock: Lehigh Valley in Whitehall, PA. 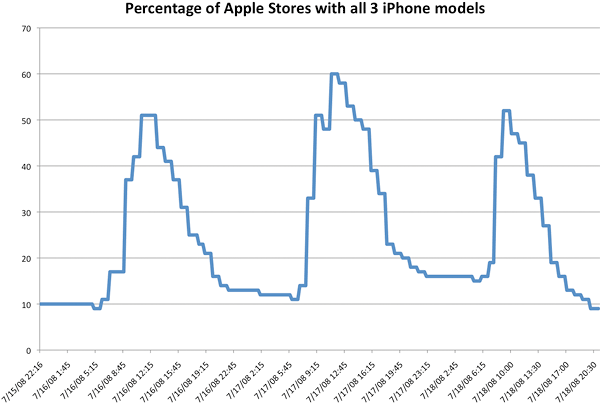 Many other stores have been mostly out of phones since I’ve been watching. The ten most neglected stores (besides Lehigh Valley) are, in order: Natick Collection (Natick, MA), Leawood (Leawood, KS), Bridge Street (Huntsville, AL), Deer Park (Deer Park, IL), Los Gatos (Los Gatos, CA), MacArthur Center (Norfolk, VA), South Hills Village (Pittsburgh, PA), Willowbrook Mall (Houston, TX), Bayshore (Glendale, WI) and West Towne (Madison, WI). If I have time, I’ll run these queries again next week when I have more data. 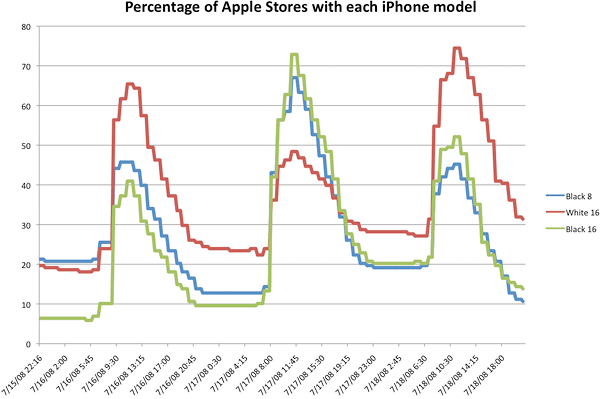 Of course, this should all be taken with a grain of salt, since it’s only as accurate as the data Apple publishes on their availability web page. But it’s better than nothing.